Mysterious and exciting, Enigma sets the stage for top-notch chefs to showcase their culinary creations. It’s a platform that allows an untold story to be unfolded through a multi-sensory dining experience using unique ingredients and modern skill – it’s a hotspot for those with curious taste buds. Dinner is served tasting menu style, with each course presenting a new ingredient of focus and a new impressive surprise. Under chef Björn’s tenure expect to be taken on a discovery of natural beauty and quality that reflects flavours of the four seasons in Scandinavia. His approach is all about purity, freshness and simplicity, and left me with a yearning to visit Sweden, to further learn about its local products. Available six nights a week, the ‘journey of a Nordic chef’ concept will run until June 30, 2016, before a new chef – also selected from the World’s 50 Best Restaurant list – will take over with a new culinary vision. Having experienced both chef Quique Dacosta’s and chef Björn’s stories, I can honestly say that I was stunned by both. They are, however, very different experiences all together – the food, ambiance, décor, approach, technique, music, and feel is different – which is a great thing (it wouldn’t be exciting if it had remained the same…). With soft rock playing in the background, the scene is relaxed yet refined. As each course is served, you really begin to feel like you could be sat deep in a gorgeously green forest surrounded by nature (the scent of pine tree wafting through the restaurant was a fantastic touch). Each dish highlights one ingredient in particular, ranging from lingonberry and sea buckthorn, to white moss and fir tree – plus others, of which many I’d never tried before (to my delight!). Chef Björn’s creativity really shone through, not only in his food, but also through the menu card prepared by him and his team. Page by page, you’re able to see the thought process that went into each dish, as well as the each plate’s construction (pictured upper right) – originality at its best! We spoke to the man himself, and here’s what he had to say…. Rewinding to the start, where did your passion for cooking develop? I had my first really good steak with a proper bearnaise sauce when I was 11 years old. That’s when my passion for food started. For diners visiting Enigma during your tenure, what can they expect?. 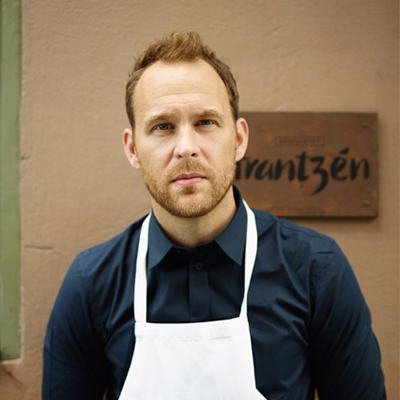 They will get to taste some of my favourite dishes, which have been served at Restaurant Frantzén over the years – and still are. How will the experience you offer be different to that of Quique DaCosta’s? I never got to experience Quique DaCosta’s dinner at Enigma, but I would assume that we differ quite a lot. The ingredients, atmosphere and even the music will be very different. Why did you choose Palazzo Versace Dubai to be your stage here in the Middle East? I see this as an opportunity to show and introduce the flavours of the Nordic countries to Dubai’s cosmopolitan residents and travellers. And, to make a collaboration with the magnificent Gourmet lifestyle Interview Palazzo Versace Dubai, which already has high standards written to its name – making it the definite right way to go. Where did your inspiration for building the menu at Enigma come from? ‘The journey of a Nordic chef’ is the theme and I have selected the dishes that fit that concept best. The dishes on the menu have been served at my restaurant in Stockholm for years and they are favorites! It’s Nordic ingredients at their best. Where have you sourced the ingredients used in your menu at Enigma from? I’m using Nordic ingredients. The logistic work behind this dinner is really something! For our home cooks looking to get a little more innovative in the kitchen, what’s a beginning technique to get started with? I think the best thing to have in the home kitchen is a thermometer. And to find out the different temperature requirements for different proteins, all you need is a quick visit to Google and you’re ready to go! What’s your take on the Middle East’s culinary scene? My only reference is Dubai, and it seems that Dubai has gathered the best of the best from all over the world in one city. The rest is yet to be discovered, and I’m really looking forward to it!